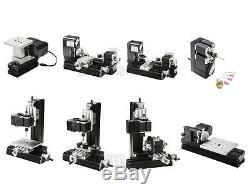 Mini Multipurpose Metal Material Machine 8 In 1 DIY Tool Kit Woodworking Lathe. Machine 8 In 1 DIY Tool Kit Woodworking Lathe Milling Drilling Jig-Saw Sanding Woodturning Modelmaking. 8 In 1 Mini Multipurpose Machine. 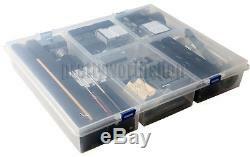 Main component is made of metal materials. Technique Data: 1 Motor speed: 20,000rpm 2 Power: 12VDC/2A/24W, 3 Table size: 90 x 90mm 4 Material: Main component is made of metal materials 5The max. Thickness of cut: hardwood: 4mm, polywood: 7mm, softwood: 18mm, sheet metal: 0.5mm, plexi-glass: 2mm. 1 Motor speed: 20,000rpm 2 Power: 12VDC/2A/24W 3 Tree 3-jaw chuck (self-centering) 4 The maximum diameter of the processed materials: 20mm 5 Length of processing materials: 135mm 6 Material: Main component is made of metal materials 7 it can process soft-aluminum, brass, copper, wood, plastics, other soft, colored and precious metals. Technique Data: 1 Motor speed:20,000rpm. 2 Power: 12VDC/2A/24W, 3 Material: Main component is made of metal materials 4 Working area: 123 x 100mm 5The item can process everything that is used in model making. Technique Data: 1 Motor speed: 20,000rpm. Hand wheel with 0.02mm accuracy 2 Power: 12VDC/2A/24W, 3 The maximum diameter of the processed materials: 45mm 4 Length of processing materials: 135mm 5 Material: Main component is made of metal materials 6 All types of wood (also hard wood) can be processed. Technique Data: 1 Motor speed: 20,000rpm 2 Power: 12VDC/2A/24W, 3 Material: Main component is made of metal materials 4 it can process wood , soft-aluminum, brass, copper, plastics, other soft, colored etc. Indexing machine with drilling attachment. Technique Data: 1 Motor speed: 20,000rpm 2 Power: 12VDC/2A/24W, 3three-jaw chuck to clamp the workpiece maximum diameter of 50mm 4 Material: Main component is made of metal materials 5 it can process wood , soft-aluminum, brass, copper, plastics, other soft, colored etc. Operating Manual Book (8 languages). Please note that the production material and models are not include. 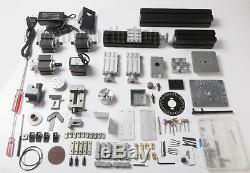 The parts in the kit can be assembled into 8 kinds of machines with different function. Jigsaw, wood-turning machine, metal lathe, milling machine, drilling machine, sanding machine, hand-held machine, drilling machine with dividing plate. Only one kind of machine can be assembled each time. Main parts: headstock, central block, jigsaw base, jigsaw casing, motor blade, gear, woodturning chisel base, cross slider, big slider, drilling lever, drilling table, jigsaw table, connection piece, sanding paper panel, dividing positioner, vice , drive belt , grinding wheel , wheel guard etc. All of the parts are made of metal except drive belt , grinding wheel , wheel guard. Motor speed :20,000rpm/min(optional choice 12,000rpm/min) 2. Input voltage/current/power:12VDC/2A/24W, Switching power input: 110V-240V 3. Jigsaw working table size:90mm90mm 4. Maximum working material diameter of woodturning lathe:50mm 5. Maximum working material diameter of metal lathe: 100mm 6. Working material length of metal lathe and woodturning lathe:135mm 7. Slider travel: Axis X=145, Axis Y=32, Axis Z=32 8. Drilling working table size: 123100mm 10. Maximum workpiece size clamped by vice:50mm 11. Maximum workpiece diameter clamped by three-jaw chuck:50mm 12. Center height of metal lathe:25mm 13. There are three circles of holes on the dividing plate and each circle with the same ratio holes. The number of the holes on each circle is respectively 36,40,48. We can choose them as needed. All of the machines are safe touch except milling machines. It requests to be used under parents or teachers instruction when the milling machine is being used by the kids. Working material thickness of jigsaw: hardwood 4mm, plywood 7mm, soft wood 18mm, aluminum 0.5mm, acrylic 2mm. It is a good tool for families and schools to do model airplane and other wood model crafts. Provide it when you order. Remote is defined as islands and highlands; or a post code/zip code that is difficult to serve; or a suburb/town that is distant, inaccessible or infrequently served. 1 X 8 In 1 Mini Multipurpose Machine. The item "Mini Multipurpose Metal Material Machine 8 In 1 DIY Tool Kit Woodworking Lathe" is in sale since Monday, April 7, 2014. This item is in the category "Business & Industrial\CNC, Metalworking & Manufacturing\CNC & Metalworking Supplies\Other CNC & Metalworking Supplies".